Coarse Thread. 1/4″ – 1/2″ diameter; 1″ – 3″ length. Each size individually packaged and labeled. 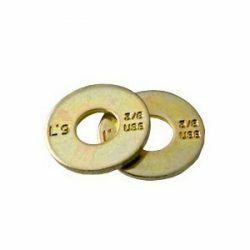 Includes 230 Grade 8 Hex Head Bolts, 135 Grade 8 Finished Hex Nuts, 135 Grade 8 USS Washers, and 135 Grade 8 Split Lock Washers, in Yellow Zinc finish. Includes 230 Grade 8 Hex Head Bolts, 135 Grade 8 Finished Hex Nuts, 135 Grade 8 USS Washers, and 135 Grade 8 Split Lock Washers, in Yellow Zinc finish. Ships free via USPS Priority Mail.